In the stomachs of tiger sharks in the Gulf of Mexico, researchers are finding something unusual: land-faring migratory birds. Sharks are known to eat seafaring birds, but land birds such as woodpeckers, meadowlarks, swallows and tanagers are unexpected. 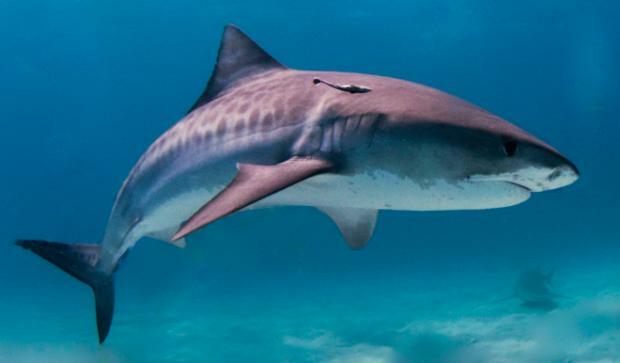 “We’re the first to look this exhaustively at the diet of tiger sharks, as far as I know, and this certainly seems surprising,” said fisheries ecologist Marcus Drymon, leader of an ongoing tiger shark diet study at the Dauphin Island Sea Lab in Alabama. The American Bird Conservancy thinks the research suggests oil platforms are to blame for dropping migratory birds into Gulf waters. Night-flying birds are known to get trapped in bright light sources, including offshore oil platforms and the 9/11 memorial lights. More than 6,000 illuminated platforms that pepper the Gulf could become giant nighttime bird lures, causing birds to circle in confusion until they’re exhausted, drop into the water and become shark food.